Points West Living Lloyminster has taken the plunge into e-health record keeping. 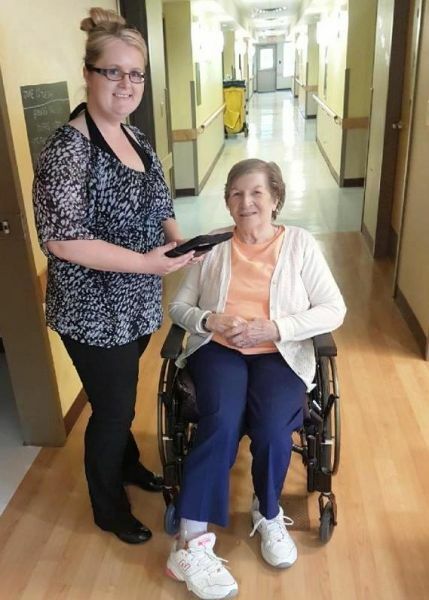 They’ve replaced clipboards with iPads, and in making the transition, they are leading the way for other Points West Living communities to streamline record-keeping and enhance care partner communication. Introducing such a fundamental change in the way each nursing care partner keeps records took a lot of preparation. First, seven ‘super-users’ were identified and attended three 4-hour training sessions. From April 23-25, the rest of PWL Lloydminster’s employee care partners took training on how to use the program. YARDI reps, as well as PWL Home Office mentors, were on hand to give support. Then on April 26, they ‘went live’ with the new system. “In the beginning, it was actually more time consuming,” says Sarah “While computers and technology are a little scary for some, they are getting used to it, and as we all become more comfortable, in the end, it will all become quicker. Our employee care partners are excited about it. As care partners, we are always striving for better communication and documentation."